The government has said it will review the future of broadband internet in the UK amid calls that it should help firms pay for installing new infrastructure. It said it wants a better understanding of how to pave the way for moving to "next generation broadband networks". The review will be carried out by the former chief executive of telecoms firm Cable & Wireless, Francesco Caio. 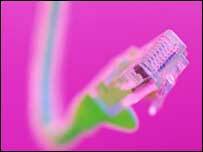 An increasing number of consumers and firms are using broadband services and new, high-capacity cables are needed. The review has been ordered by the Department of Business, Enterprise and Regulatory Reform. According to the industry, the current telecoms infrastructure cannot cope with the increase in demand for services such as downloads of films, videos and music. The review will report back to ministers and Chancellor Alistair Darling in the autumn. "We need to prepare the way for the UK to adopt groundbreaking new technologies to ensure that we do not get left behind - competitively or technologically," said Business and Competitiveness Minister Shriti Vadera. 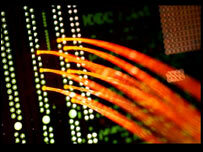 Last April, the Broadband Stakeholder Group, a government advisory body, warned that the government had two years to find ways of boosting investment in the next generation of broadband connections. France and Germany are already trialling broadband services with much faster download speeds than anything offered in the UK. But installing the cables and other technology needed for very high speed broadband is extremely expensive. An estimate by Enders Analysis put the cost of providing that service to 5.6m BT residential customers at £1.1bn. Analysts say cost is not the only problem. "The business case for next generation access is weak, Virgin Media already has a high speed network and Sky has a strong hold of the premium content that users might actually pay for," said Ian Watt, head of fixed-line research at Enders Analysis. Other analysts point out that the benefits of switching from the old, dial-up internet service to broadband was clear and customers were prepared to pay for it. But according to Nickin Patel at Spectrum Value Partners it is "not clear" to consumers what the benefits of even greater speeds would be.